SCVHistory.com | People | Francisco Garcia: Centenarian Says He and Lopez Discovered Gold (Story 1896). Centenarian Says He and Lopez Discovered Gold. La Fiesta de Los Angeles, a week-long celebration staged by the merchants association of that city, kicked off with a parade on April 22, 1896. With seating at Seventh and Hope streets, the parade reportedly included "floats, Chinese, caballeros, military uniformed clubs" — and Ygnacio Francisco de la Cruz Garcia, aka Francisco Garcia, who was about to turn 115 years old. Long Life of a Man Appearing in Yesterday's Parade. Los Angeles Times, April 23, 1896. Ygnacio Francisco de la Cruz Garcia, the aged Mexican who appeared in the fiesta parade yesterday, will be 115 years old, if he lives until the 1st day of May. He was born in Sonora, Mex., in 1781, from two to forty years before twelve of California's twenty missions were built, and three months before the first colony arrived to found the Pueblo de Neustra Senora la Reina de Los Angeles. "At the parochial Church of San Jose de Garcia on the fourth day of the month of May, in the year one thousand seven hundred and eighty-one, I solemnly baptized a child three days old, whom I named Ygnacio Francisco de la Cruz Garcia, said child being the legitimate son of Don Jose Garcia and Dona Mariana Gonzales, both from Spain. The godfather of said child being Don Felipe Carpena and the godmother Dona Serafina Carpena." When Francisco was 27 years old he was a soldier under Carlos IV of Spain, when Mexico was beginning to chafe under the yoke of the mother country. In 1825, in company with Don Juan Maleriu, a friend of his father, he came to Los Angeles. It was then a small pueblo built around the old plaza, which lay southwest of the present one. The pobladores were then worshiping in the small chapel that stood between Buena Vista and New High street before the present Plaza church was completed. Santa Felicia (San Feliciano/a) Canyon. Click to enlarge. In 1838 Francisco returned to Mexico, one of a company of thirty-six people. On this journey they had some hair-breadth escapes from the Indians; himself, wife and a man were captured and held prisoner eleven days, their lives being saved by command of the chief. He thinks he left Mexico the same year for California by way of the Colorado River. 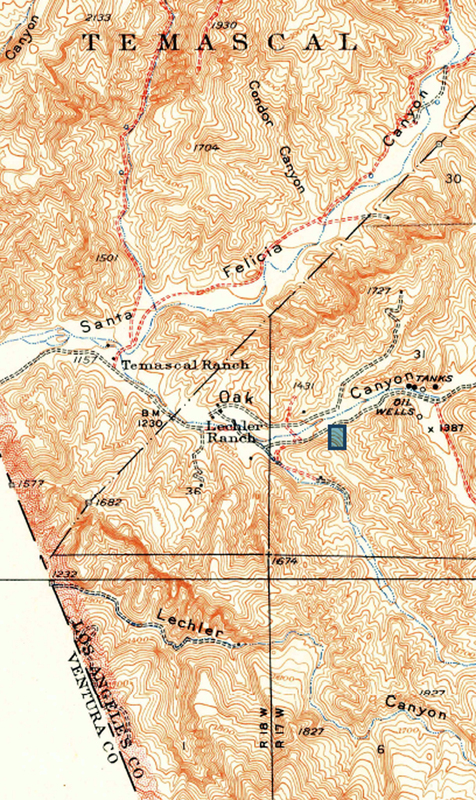 In the Santa Feleciana Cañon, some forty miles northwest of Los Angeles, he and Francisco Lopez and another man discovered the first placer gold found in the State, though this date does not coincide with that given by Don Abel Stearns and others. It would not be surprising, however, that there should be a lapse of three or four years in the memory of a man of his age. He is especially fond of having once been a miner worth more than $30,000, but with a miner's luck he lost all his money and is now a pensioner on the county. The old man narrates excitedly that he was a fine horseman in his younger days, with the national fondness for racing, and that he could make the trip to Mexico on horseback in one month and sixteen days. He was also, he says, a fine dancer, and loved to dance the old Spanish dances. Don Francisco lives alone, in one of the old adobes on Buena Vista street, and walks from there in to the business part of the city every day, and back later in the day, never neglecting to stop for devotions in the old church where has told his beads for so many years. His memory is better than that of most men fifty years younger; his eyesight and hearing perfect enough to recognize his friends in passing without hesitation; his hair, though white, shows no baldness on the head, and he still retains his third set of teeth. Last year he rode in the fiesta procession with the caballeros, but this year, to his great grief, he was overlooked. On Tuesday he toiled up the stairs of the Chamber of Commerce with an interpreter and asked the privilege of riding with the horsemen, because he was centenarian and had been a resident of Los Angeles "mucha anos" [sic]. He was given an order for the much coveted suit and sombrero and assigned to ride in a carriage, and no one who observed his red bandana waving in the wind could fail to see that the occasion was one of the proudest days in Francisco's long life.